Above: Red River Brewing Company. While there, end it with the Mile High Ice Cream Pie, an Instagram-worthy mound of indulgence. Photograph Courtesy of Red River Brewing Company. In a resort town where much of the architecture is of a different time, the new Red River Brewing Company stands out. 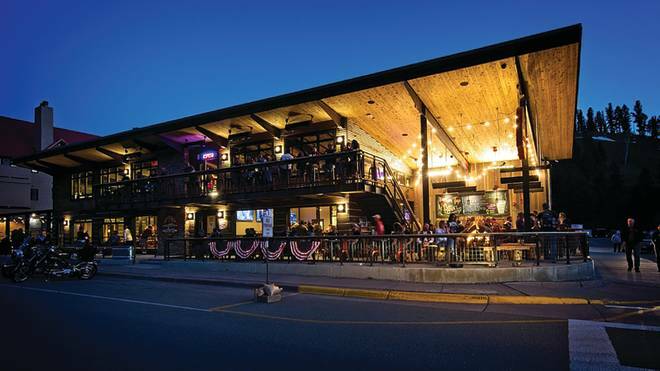 The 9,000-square-foot open-air space, which sits on the main drag across from the Platinum chairlift at the ski area, nails the mountain-chic aesthetic of its time—wood and steel everything and a large patio and upper balcony lined with tables and hanging bulb lights. On a warm day last summer, every outdoor table was full. The wait staff handled the crowd with ease. Several dogs lounged while their owners ordered wings, burgers, and beers. A couple played jumbo Jenga near the beautiful reclaimed-wood outdoor bar. The 12 beers on tap could use some tweaking—the IPA was too sweet for my taste—and the food is relatively basic pub fare, but you can’t beat the setting or location in this town. The brewery is a family project, with three generations pitching in on everything from the brewing to the architecture and the design of the tap handles. Michael and Sharon Calhoun, formerly of Los Alamos, where Michael worked at the lab for 25 years, own the brewery with other members of the family. Over a beer at Bathtub Row, in Los Alamos, the Calhouns decided it was time to open a brewery of their own. For visitors in town for Red River’s Oktoberfest, October 5–7, it’s a must visit.